The racing career of the TVR T400R isn’t over quite yet. John Hartshorne’s car, actually the very first Tuscan R / T400R built, has now passed from Dennis Leech’s RSS outfit into the technical care of Chad Racing, Iain Dockerill and Nigel Greensall amongst the principal players. Greensall was on hand at Silverstone today, Sunday (January 22) and confirmed that the car is to be entered in the full season of Le Mans Series races and that an entry has been posted for the Le Mans 24 Hours, where the car just missed out, by a couple of laps, on a classified finish in 2005. There's a good degree of continuity here with the 2005 Le Mans effort, because of car owner John Hartshorne. If a Le Mans entry arises for this car again, one of Hartshorne's 2005 partners should be involved again, and the car would probably run in familiar colours: only the technical back-up would be different. Greensall himself will not be on the Le Mans Series driving squad (likely to be Hartshorne / Dockerill / TBA), but will be charged with development and testing duties before the start of the season. 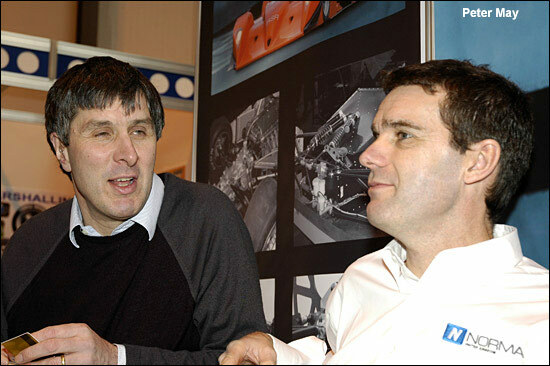 Here are Hartshorne and Greensall, at the NEC a week or so ago - just about to discuss the season's plans.